So what's on your list for 2015? Yikes! Only Two Days 'til Christmas! Where did this month go in such a hurry? Only two days before Christmas and I'm still baking and making small gifts! I won't be blogging until after Christmas, so Happy Holidays everyone! I'll be back sometime this weekend, I think. Yesterday, I double-checked my virtual quilt representation in Electric Quilt (EQ) and found nothing wrong. It must have been my imagination that things seemed wrong! But I did make some changes because I did my borders differently than I thought I would. I thought I had cut 2" strips of beige for borders when I cut my 1.5" logs, but I couldn't find them anywhere so thought I'd have to do my best with the 8 inches left of that yardage. On Saturday, I spied the missing strips underneath my chair. It's an office chair with those five rolling legs and it's pushed against a dark wood bookcase when I'm not sitting in it, so it's easy to miss something small directly under the legs. I suppose I have Trudy (chihuahua) to thank for the strips being on the floor. 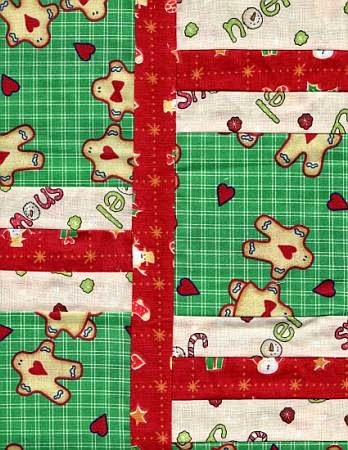 Border 1 (could also be called the top sashing): cut 2 strips 2.5" x WOF of dark fabric, sew to top and bottom of quilt top. This makes the top square. 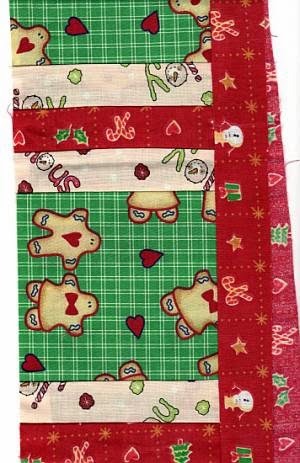 Border 2: cut three strips 2" x WOF and one strip 3" x WOF of light fabric. Sew two of the narrow strips to the sides. Sew one narrow strip to the top. Sew the wide strip to the bottom. Border 3: cut one 3" x WOF of focal fabric, one 2" x WOF of light fabric, one 1.5" x WOF of dark fabric, and one 2.5" x WOF of light fabric. 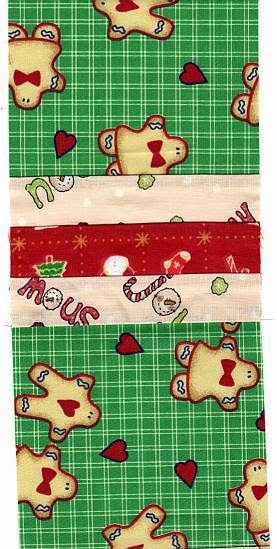 Sew these strips together, then sew the completed border unit to the top edge. 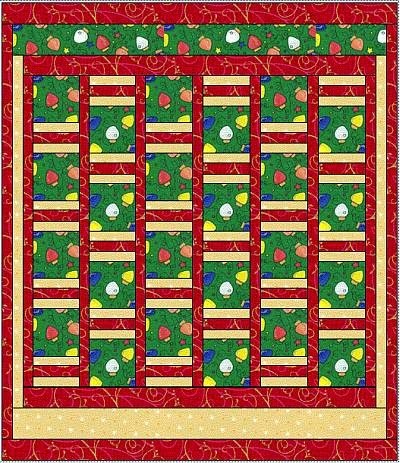 Note: I chose not to add more borders to the bottom edge because I'm running out of yardage. 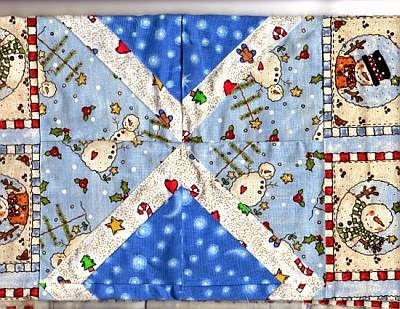 But if you have yardage to spare, you can add to the bottom edge the same borders as the top edge to make your quilt a few inches longer. 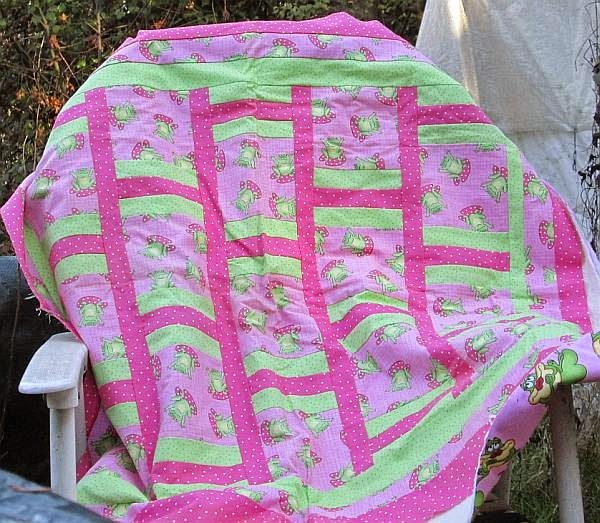 I've tried the "quick" pillowcase or birthing method of finishing a quilt and don't like it much. Seems to take me longer to turn it and get those edges to lay correctly and then quilt (or tie) it than it does to quilt it and sew on a binding. Our normal, cold winter weather has returned, but I spent a couple of hours in my shed today sewing borders on. As I worked, I noticed that my measurements were not matching those in my EQ rendition. I must have goofed somewhere! I brought the completed top over here where my computer is. Tomorrow, I can redraw what I actually sewed instead of relying on my memory. I took a short break from my sewing when my mom's caregiver popped in to chat before going home. All of a sudden, my sewing machine started sewing all by itself! After a flustered moment or two, I looked down and saw Dusty calmly sitting on the foot pedal. When I shooed him off, his look seemed to say, "Gee, what's all the commotion about?" Surprisingly, I didn't have to frog-stitch and redo the 2-3 inches that he sewed. Can I now claim that this project is so easy that even a dog can sew it? Well, things didn't go as planned today. I awoke feeling ill. By the time I felt like moving about and doing things, the weather changed drastically. The wind began blowing, the temperature fell, and the rain came down by the bucketfuls. Without an umbrella, I would have been drenched to the skin in just a few short seconds. It's nearly 100 steps to my sewing shed, so I elected to stay in my office and do computer stuff. 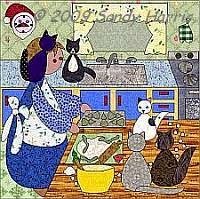 But thanks to Electric Quilt software, I can show you what I planned to do today. I was a little off on my measurements last night. EQ says the top at this stage should measure about 34.5 x 30.5 inches. From here, my first step is going to be to add red sashing strips to the top and bottom, but I'm going to cut these strips wider than the vertical strips so that I can add some length to the quilt. Cutting my strips 2.5" wide will add four inches to the length, making to top square (about 34 x 34 inches). 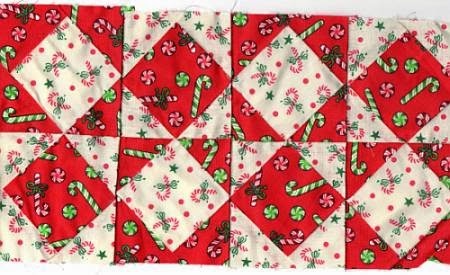 If you need a table topper, this is a good place to stop, or just add the same width borders to all four sides to keep it square until you get the size you want. Where I go from here with each top largely depends on how much of each fabric I have left. I usually put borders of each fabric on all four sides of the top, but I don't have enough left of the green and beige fabrics to do that this time. So this quilt will have an asymmetrical look. First, I'm going to add 1-inch side borders (cut two strips 1.5" x WOF) in beige, then a 2.5-inch (cut 3" x WOF) bottom border in beige. I have one 3-inch wide strip of green fabric left, so I'll use it for the top border. The quilt will be about 36" x 39" at this point. 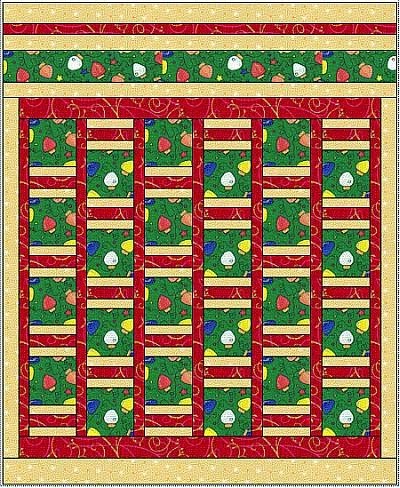 I still have enough red fabric to do a border on all four sides, but I'll make the top and bottom borders wider than the sides to add a few more inches to the length of the quilt. I'm currently thinking of 1-inch borders (cut 1.5" x WOF) on the sides and 2-inch borders (cut 2.5" x WOF) at the top and bottom. This could change when I see how much fabric I actually have to work with. If I do indeed use these measurements, the top will be 38" x 43" -- big enough for a baby quilt or a small lap quilt. 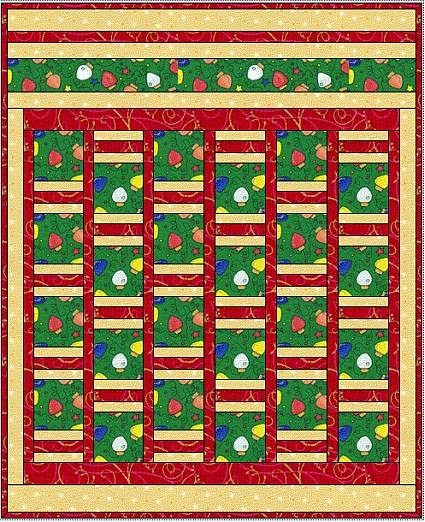 To make your quilt larger, you can increase the width of the border strips or add more borders. Adding 4-5 inches to the width and 10-12 inches to the length will make a decent-sized crib quilt. Part 3b will show what I actually end up doing! It's past 9:00 now and the rain has finally stopped. I'm hoping for better health and milder weather tomorrow. It was a typical drippy, rainy day here in Oregon, but it was an unsually warm 58 F. So warm that I left my shed door open so the dogs could come and go freely. Big mistake! I forgot all about the mud they'd be tracking in. If you see a few paw prints, you'll know why. Tomorrow, I'll have to rig up a way to hang things on my door (I have no wall space) to take photos. I opted to use my scanner today to avoid as many muddy paw prints as possible. Okay, let's get started. We're going to do a lot of what I think of as sewing on the freeway: pedal to the metal and only breaking for nature calls, winding the bobbin, and chihuahuas who stand between me and my sewing machine (I really have to think of a new way to arrange my shed so Trudy can't do that). Step 1: Sew the strips together. I like to sew the three "log" strips together first, then sew them to the "bump" strip. But they can be sewn in any order as long as you end up with four strips of fabric sewn together with the three narrow strips all side by side. Step 2: Press the seams in any direction you desire, then subcut the strips into 5-inch wide segments. These are what I call the Bump on the Logs. If your fabrics are close to 42" wide or wider, you should get eight segments per strip. If your fabrics are closer to 40" wide, you might only get seven segments per strip. I got eight segments per strip, for a total of 24 Bumps on the Logs. Step 3: Sew four units together, "bump" end to "log" end. Repeat this six times to make six strips of four units. Press the seams. My scanner couldn't get more than 1-1/2 units, but I hope you get the idea. Step 4: Cut 6 strips 1.5" x WOF for the "sashing." I chose my red fabric. Decide how you want your Bump on the Logs columns to go. I chose to alternate mine: bump on the top, logs on top, bump on top, etc. Sew a sashing strip to the right side of your first column. Press the seam. Step 5: Sew your second column to the sashing strip used in step 4. Press the seam. Step 6: Sew a sashing strip to the right side of the second column; press the seam. Sew the next column to this sashing strip; press the seam. Repeat until all columns have been sewn together with sashing. Step 7: Sew the last sashing strip to the left side of the first column. Press the seam. You should now have a top that measures about 28" long and 34" wide. In part 3, we'll add borders and change the dimensions so that the top will be longer than it is wide. 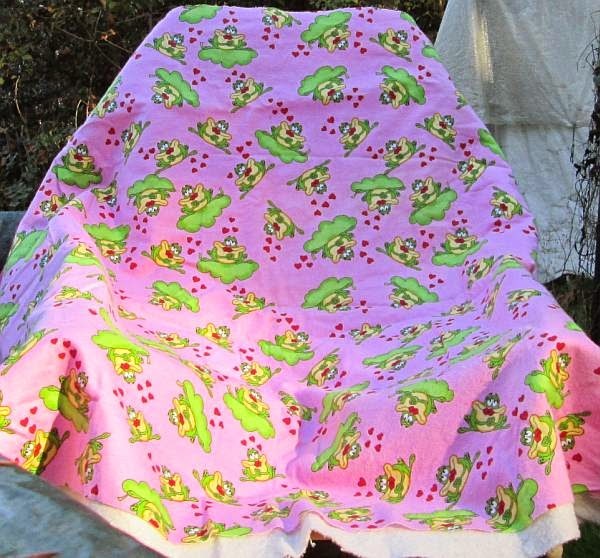 About six or seven or maybe eight years ago, I was browsing through the fabric isles when a bright pink and green fabric with frogs caught my eye. I'm not sure why it was calling to me. I really dislike lime green, I think pink is best used in small quantities, and I don't have a particular penchant for frogs. I like frogs, I just don't collect froggy things. But that fabric didn't care. It was calling me loud and clear. 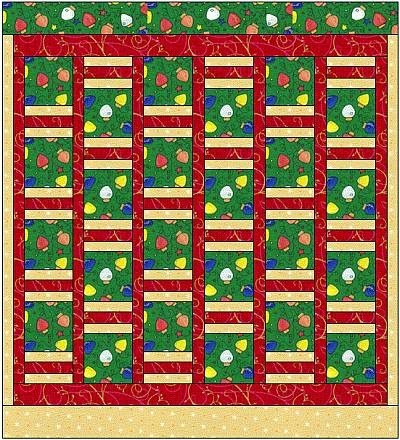 I was planning to publish this pattern, but before I got things written up one parent was hospitalized, then the other, and so on and so forth. A few years passed and I began seeing similar designs published in magazines. They weren't exactly the same as mine, but nevertheless the similar designs took away the excitement of publishing my own. 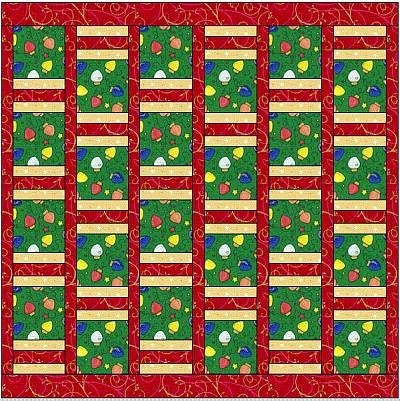 Instead, this design became my personal "go to" pattern whenever I needed to make a quick gift. But my first one hasn't even been quilted, yet! It is sandwiched, though. The photo doesn't do it justice. We had a rare sunny day so I hurriedly unfolded it and took a snapshot before the dogs jumped on it with their muddy paws. I still don't like lime green. I still think pink should be used in small doses. And I still love this quilt. It's bright and happy and makes me smile. And the backing is just as fun! The weatherman has promised us 3-4 days of warm winter weather (highs in the low 50's) -- perfect for working in my sewing shed. 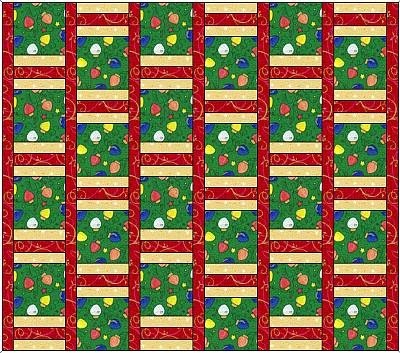 It's time to put this pattern to use on some of that 2-foot high pile of Christmas fabric. Each time I make this pattern, I change it up a bit. That's part of what makes this a great design, in my opinion. 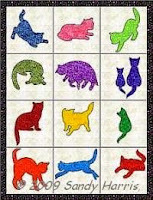 I can play with it, adapt it to my needs, and no two quilts ever have to look exactly alike. Here's another top that was made with the Bump on the Logs units, but it looks quite different. 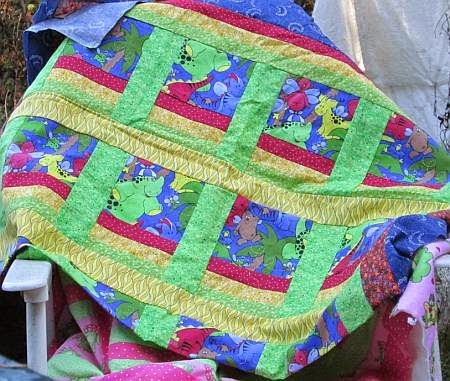 The Bump on the Log units in the frog quilt were sewn together in vertical columns. Those in the dinosaur top were sewn together in horizontal rows. The dinosaur top also uses seven different fabrics instead of three as in the frog top. I have another top buried in a tote box somewhere that was made from pre-cut 5-inch charms and 2.5" strips that looks completely different from these two. I can't wait to see what the next one will look like! Actually, it might look similar to the frog one since I've chosen to keep things simple this time and only use three fabrics. I only had 18 inches of the green fabric, 22 inches of the beige, and one yard of the red. So by default, the green fabric is my focal fabric (the Bump), and the beige and red fabrics are my strips (the Logs). The frog top has 15 Bump on the Logs units, but I'm choosing to make 21-24 for this project. Save all leftovers for borders and the strips that hold the Bump on the Logs units together. My internet speed has been even slower than usual the last few days. Do you suppose Cyber Monday shoppers have been causing traffic jams in cyberspace? I found another little work-in-progress that I had forgotten all about. My brain is starting to dredge up a few memories about these projects. I was working on them at my mom's house several years ago when I had a little table there for sewing. When the pellet stove was installed, I lost my little sewing space. Everything was hurriedly packed up and over the years I just forgot about them. Every winter since, I try to find a way to carve out a little space for a sewing machine, but no success yet. Maybe this will be the magic winter. I'm not sure where I was heading with the little candy cane project above. What you see is all there is of it, just eight little 3-inch square-in-a-square blocks. I still have a yard of the light and about 1/4 yard of the dark fabric, but I'm not real keen on making more of these blocks. Maybe it'll become a mini row sampler of some kind. Or maybe it wants to be a towel hanger or the bodice of an apron. Any other ideas? It's a normal cold, rainy day here in the Pacific Northwest once again. The brunt of the cold front hit just north of me, but my sewing shed was still only 40 F yesterday afternoon. 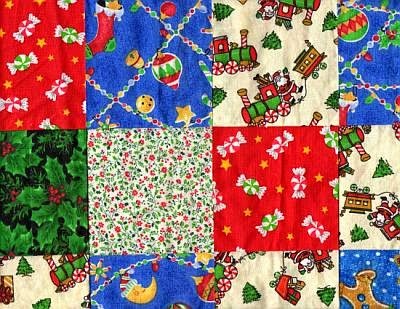 I spent about 45 minutes digging through my Christmas fabrics, then high-tailed it back to my mom's house where both the pellet stove and the old wood stove were fired up (it takes a lot to heat an old house that doesn't have modern insulation). 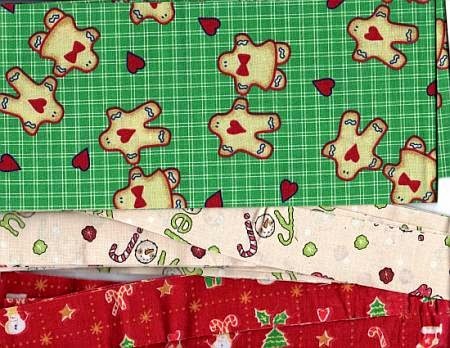 Once my hands thawed out, I started sorting through a drawer of Christmas fabric I had stored over there and had completely forgotten about. More surprising was the discovery of two works-in-progress: a table runner and the beginnings of a one-patch topper. I remember the fabrics in these projects quite well, but I have no real memory of sewing these projects. Finding them is kind of like finding unexpected gifts! 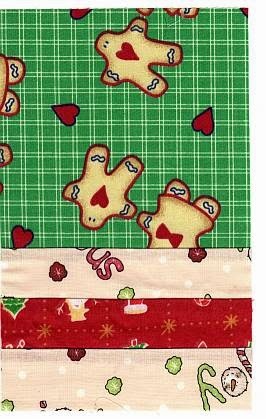 Here's a section of the table runner. All it needs, besides a good pressing, is a border of some kind and then it can be sandwiched, quilted and bound! This scan shows about half of the one-patch project. I must have been cutting scraps from other projects into 4.5-inch squares and sewing them together as I went. This little WIP now has 5 rows across and 5 rows down -- not really big enough for much of anything. I think I'll just continue adding rows to it log cabin style until it's either big enough for something or I run out of scraps. I'll probably meet the former before the latter!